4 Verbs with the stem "trinken"
Do you like to drink red wine? What do you want to drink during the meal? 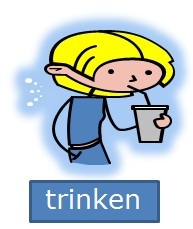 "trinken" is an irregular verb with haben as auxilary verb. Verbs with the stem "trinken"